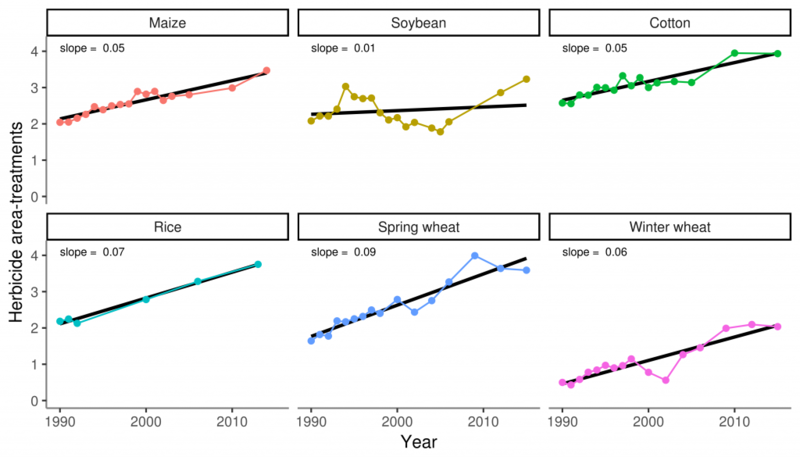 If you take a broad look at national level data in the US, it is difficult to make a case that GMOs, as a monolithic entity, have had a dramatic impact on crop yields. But I can think of very few traditional plant breeding efforts that have led to a “quantum leap” in crop yields across the board. If the inability to generate a “quantum leap” in crop yield is a failure of crop biotechnology, it is also a failure of traditional plant breeding methods. Does this mean we should stop investing money in traditional breeding efforts? Certainly not. Why should we expect GMO crops to have this kind of impact? [T]he only reason we’d see an increase in crop yields due to [current GMO] traits is if we didn’t have adequate tools to manage those pests prior to the introduction of the GMO traits. For corn and soybean in particular, it is not at all surprising we’ve not observed major yield increases due to these traits. Corn and soybean represent huge market opportunities for pesticide development, and therefore, many tools were already available to manage weeds and insect pests in those crops. But there are situations where GMO traits have contributed to major yield increases. “At the same time, herbicide use has increased in the United States, even as major crops like corn, soybeans and cotton have been converted to modified varieties. And the United States has fallen behind Europe’s biggest producer, France, in reducing the overall use of pesticides, which includes both herbicides and insecticides. 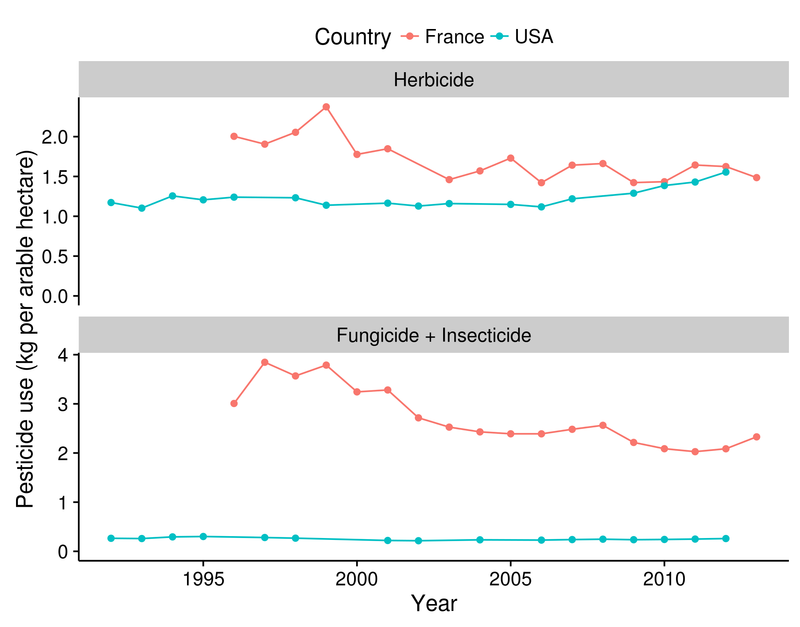 It is true that France has been reducing pesticide use [actually, maybe not… see update at the end], but France still uses more pesticides per arable hectare than we do in the USA. In the case of fungicide & insecticides, a LOT more. But a relatively tiny proportion of these differences are likely due to GMOs; pesticide use depends on climate, pest species, crop species, economics, availability, tillage practices, crop rotations, and countless other factors. And almost all of these factors differ between France and the U.S. So this comparison between France and the U.S., especially at such a coarse scale, is mostly meaningless, especially with respect to the GMO question. If one of France’s neighboring EU countries with similar climate and cropping practices had adopted GMOs, that may have been a more enlightening (but still imperfect) comparison. Given all of these confounding factors, I wonder why France was singled out by Mr. Hakim as the only comparison to compare pesticide use trends. 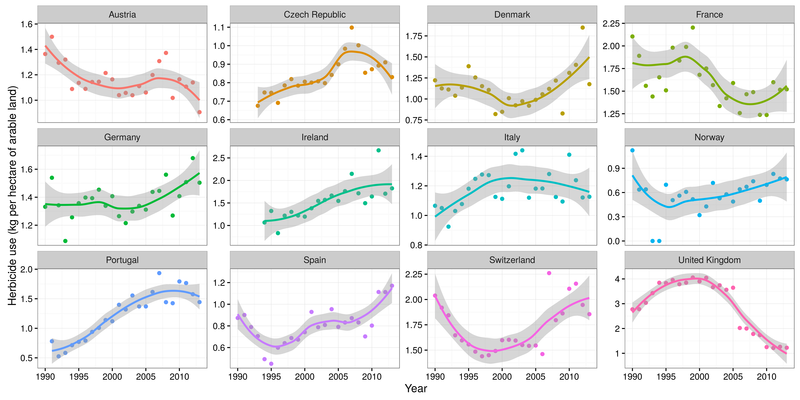 Pesticide use across Europe varies quite a bit, and trends in most EU countries are increasing, France is the exception in this respect, not the rule. In the early 1990’s, France was using more herbicides compared to almost every other country, so it shouldn’t be too surprising that pesticide use decreased as formation of the EU began to standardize pesticide regulations after 1993. If the increase in herbicide use in the U.S. is due to GMOs, what can explain the increase in herbicide use throughout most of Europe, where GMO varieties are not available? “The use of HR crops sometimes initially correlated with decreases in total amount of herbicide applied per hectare of crop per year, but the decreases have not generally been sustained. However, such simple determination of whether total kilograms of herbicide used per hectare per year has gone up or down is not useful for assessing changes in human or environmental risks. Mr. Hakim cited the NAS report to support his conclusions on yield gains, but apparently missed this important recommendation from the report. Instead of looking at weight of pesticides applied, it is more instructive to look at the number of active ingredients being applied to each field. I recently did this for the U.S. and found that herbicide treatments were increasing in the three glyphosate resistant crops (corn, soybean, and cotton). But herbicide use was also increasing in rice and wheat, where no GMO varieties are commercially available. In fact, the pace of herbicide increase was slower in the GMO crops than non-GMO crops. From these data, one could make a plausible argument that GMO crops have decreased herbicide use, since the increase in herbicide use has been slower compared to non-GMO crops. But this is the problem with trying construct a narrative from imperfect, national-level data. I don’t actually know whether GMO crops have increased or decreased herbicide use (and neither does Mr. Hakim). We can each use different versions of the best data available to fit contrasting narratives. But the answer is far more complex than anything we can derive from data that weren’t explicitly generated with this question in mind. I’m a little taken aback that Mr Hakim went full Godwin in the New York Times in an article about GMOs and pesticides. Setting that aside, it is indisputable that pesticides are, indeed, toxic. But so are antibiotics, and pet flea collars, and nutritional supplements, and salt, and caffeine, and almost every other thing we come into contact with in our daily lives. With respect to the impacts of pesticide use, the question should be how toxic, and to which organisms? The toxicity of different pesticides differs dramatically, by several orders of magnitude. And many pesticides are practically non-toxic to humans. To say that pesticides are all toxic, while certainly true, misses the point. The questions we should be asking is whether we are using pesticides that are more or less toxic than we would be using if we didn’t have GMOs. Mr. Hakim decided not to address this issue. But I have. The herbicide that we’re using more of because of GMO crops has probably contributed to a major reduction in chronic toxicity (I say probably, because again, we can’t know for sure what would happen in an alternate universe without GMOs). Glyphosate has a lower chronic toxicity than 90% of all herbicides used in the US in the last 25 years. In 2014 to 2015, glyphosate made up 26% of corn, 43% of soybean, and 45% of cotton herbicide treatments, yet only contributed 0.1%, 0.3%, and 3.5% of the total chronic toxicity of herbicide use in those crops, respectively. There are trade-offs involved with every decision farmers make, including the choice to use (or not use) glyphosate and GMO crops. If GMO crops were not available in the U.S., or if glyphosate use were discontinued (as was recently proposed in the EU), the resulting displacement of glyphosate by other herbicides would almost certainly have a negative impact on chronic health risks faced by pesticide applicators and farm workers. I really hope the conversation can eventually move beyond whether GMO crops have met some arbitrary initial expectations, regardless of the origin of those expectations. If that means we all need to simply acknowledge that GMO’s have failed to meet those goals, then fine. I concede. Not because I think the data overwhelmingly support that conclusion, but because this is a tiresome conversation that distracts from much more important issues in agriculture. GMO’s have not (and will not) result in an agricultural panacea. But that doesn’t mean they don’t have value. Trends in pesticide use on arable crops in France between 2001 and 2014 were described. No change in pesticide sales was observed at the national scale. The paper uses multiple data sources, and instead of just looking at pounds of pesticides applied, it actually quantifies the number of pesticides being applied to crop lands. The number of herbicide applications per acre was mostly steady between 2001 and 2014. But herbicide use actually increased for sugar beet in France, a crop for which GMOs have reduced herbicide use in the U.S. Previous Article Is the Environmental Impact Quotient (EIQ) better than nothing? Next Article Could GMO corn be responsible for increasing childrens’ IQ?